The Russian Soyuz TMA-6 spacecraft is launched to put the International Space Station's Expedition 11 crew in Earth orbit. The departing crew of the international space station safely returned to Earth aboard a Russian Soyuz capsule today, closing out a six-month stay in space with a spectacular re-entry. Because of concern about low power in a backup battery, Soyuz commander Salizhan Sharipov carried out a power-conserving manual undocking at 2:45 p.m. EDT as the two spacecraft raced 220 miles above central Asia. Sharipov, Expedition 10 commander Leroy Chiao and Italian astronaut Roberto Vittori fired the Soyuz's braking rockets for four minutes and 23 seconds beginning around 5:17 p.m. The returning station fliers made the re-entry in the Soyuz's descent module after the capsule's no-longer-needed orbital and propulsion modules had separated. Video from the space station, flying almost directly overhead, showed the two discarded modules streaking through the pre-dawn darkness below trailing flaming debris as they broke apart in the atmosphere. 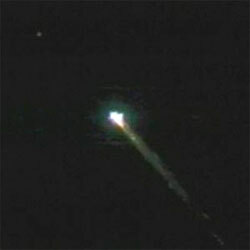 The descent module carrying the crew was visible well ahead, a small moving point of light as it fell to Earth. Following parachute braking and a final burst of rocket power, the descent module touched down near Arkalyk, Kazakhstan, around 6:08 p.m. (4:08 a.m. April 25 local time). NASA commentator Rob Navias, on the scene in Arkalyk 53 miles from the landing site, said the spacecraft landed on its side about 60 feet or so from a river. Because of muddy ground conditions, the crew was flown to Arkalyk for medical exams. All three told recovery crews they felt fine. Vittori, representing the European Space Agency, rocketed into orbit April 14 (EDT) with Expedition 11 commander Sergei Krikalev and flight engineer John Phillips. Krikalev and Phillips plan to remain aboard the station until the next full-time crew is launched in late September. "We're pretty excited to come home," Chiao told a reporter last week. "It's a fantastic mission, six-and-a-half months, it's the first long-duration mission for both of us. For me personally, it's been wonderful but I am anxious to get back and see my wife and family and friends and to be in nature again." Said Sharipov: "For me, it's been a great flight as well. It was a great adventure, I had a lot of interesting work and I am very satisfied that I was given an opportunity to be able to work on board the international space station." Touchdown for Chiao and Sharipov will close out a 193-day stay in orbit that began with launch from the Baikonur Cosmodrome last Oct. 13 (EDT). They were the 10th full-time crew to take up residence aboard the international space station since the first crew arrived in November 2000. As of today, the space station has been continuously manned for 2,348 days by 28 U.S. and Russian astronauts and cosmonauts. This was Chiao's fourth and final spaceflight. Asked what he would miss the most, he said "just being here." "Of course, living up in space for nearly six-and-a-half months, I am anxious to get home," he reflected last week in an interview with CBS News. "(But) the view out the windows here is spectacular, unparalleled. Taking photographs of the Earth is a new hobby that I've acquired over the last six-and-a-half months. I'll miss that. "And you know, just floating around and working in space is something I know I'll miss. This will be my last spaceflight, so I'm really kind of trying to savor every moment here and it's going to be a bitter-sweet moment when we leave." Unlike some, Chiao said he and Sharipov never got too lonely or felt any deep sense of isolation. "I think I expected it to be a little more difficult than it was," he said. "Salizhan and I are about the same temperament, we're both easy going so we really had no problems at all with each other. We were dealing with the ground just fine, we all worked as a big team ... and we really didn't have any of the problems that I kind of anticipated might crop up. So I think I was fortunate that my crewmate and I just got along great." But as one might expect, they did miss friends and family. "Of course, we miss our families and friends when we're up here, no question about that," Chiao said. "We do have means to keep in touch with folks but it's not the same as being face to face with them and going out and doing things with them. So while we maintain our connections with our loved ones on Earth, we definitely do miss them. We do get lonely, no question about it." Despite one to two hours of exercise per day, Chiao and Sharipov will face about a month of intense physical therapy to help them readjust to the unfamiliar pull of Earth's gravity. Krikalev, one of the most experienced space fliers in the world, said "it's not as hard as some people imagine" as long as the returning crew takes it easy and doesn't "rush too much" trying to get back to normal. Krikalev and Phillips face a busy month of work to ready the station for the arrival of the shuttle Discovery, scheduled for launch May 22 from the Kennedy Space Center. The goal of the first post-Columbia shuttle mission is to deliver a new gyroscope and tons of equipment and supplies as NASA restarts station assembly after a hiatus of nearly two-and-a-half years.